The essential formulae to be remembered in connection with direct current circuits were given in the post daied 31st March 2008. A couple of free response questions were posted on 5th April 2008. Today we will discuss a few multiple choice questions in this section. The switch S has been closed for a long time and the capacitor C has been fully charged. If the voltage across the capacitor is found to be 3 V, what is the current flowing through the resistor R1? I = 3 V/6 Ω = 0.5 A. The current through R1 is the same as that through R3. So the correct option is 0.5 A. 0.5 A = 9V/(5+6+6+r)Ω so that r = 1 Ω. Question numbers (3), (4) and (5) given below relate to the adjoining circuit in which a current of 2A enters the network of resistors R1, R2, R3, R4 and R5 through the junction P and leaves through the junction Q. The resistors R1, R2, R3 and R4 make a balanced Wheatstone bridge since R1/R2 = R3/R4. No current can therefore pass through the resistor R5 so that it can be ignored. The circuit therefore reduces to 3Ω (which is the series combined value of 1Ω and 2Ω) in parallel with 6Ω (which is the series combined value of 2Ω and 4Ω). Therefore, the effective resistance between the junctions P and Q is (3×6)/(3+6) = 2 Ω. 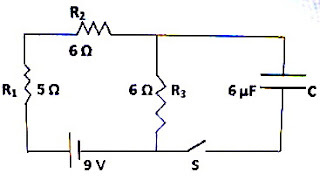 Since the effective resistance between the junctions P and Q is 2 Ω (as shown above) and the current flowing into the network is 2 A, the potential difference (IR drop) between the junctions P and Q is 2×2 = 4 V.
The resistor R5 can be ignored as we saw while answering question No.3. The current flowing through R4 is the current flowing through the lower parallel branch containing R3 and R4. The lower parallel branch has total resistance 6 Ω and the upper branch has total resistance 3 Ω. The current being inversely proportional to the resistance of the branch, the main current of 2A must get divided in the ratio 3:6 (= 1:2) between the lower and upper branches. The current through the lower branch must therefore be 2×(1/3) =2/3 A which is very nearly equal to 0.667 A. 2× (1+2)/(1+2+2+4) = 2/3 = 0.667 A, very nearly].